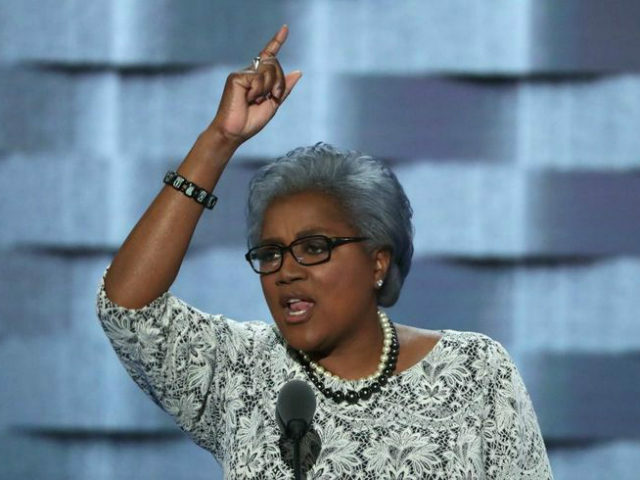 Former interim Democratic National Committee Chair Donna Brazile said she experienced sexism from Hillary Clinton’s top male aides and that it prompted her to tell them to put their “dicks out on the table and see who’s got the bigger one, because “I know mine is bigger than all of yours,'” during a conference call, according to her upcoming book Hacks. The book reportedly says all of Former Hillary Clinton campaign manager Robby Mook’s top aides were men: “The young men that surrounded Robby Mook ― and they were all men in his inner circle ― had mastered a cool and removed style of politics.” However, the Huffington Post notes that Mook’s chief of staff, campaign chief operating officer, communications director, and rapid response director were women. The book also details how Brazile created an emergency plan to replace Clinton with then-Vice President Joe Biden after her deteriorating health condition came to light. Clinton fainted during a 9/11 memorial, reportedly due to pneumonia. Hacks also revealed how the Democratic Party rigged the nomination to provide Clinton with more access and clout than Sen. Bernie Sanders (I-VT) in exchange for fundraising assistance to help raise the Democratic Party out of debt. Former DNC Chair Debbie Wasserman Schultz oversaw this. We don’t recognize a lot of the situations and certainly the tone and tenor of the campaign. This was a hard-working group of wonderful people. She claims that the leadership of the campaign was all male. I’ll tell that you is absolutely false. It’s demeaning to our communications director, our digital director, our political director, our chief operating officer, my own chief of staff. Women were integral to the leadership of our campaign. Hacks is set to be released on Tuesday.